Fig.1 The long flower stalks of cyclamen (Cyclamen persicum) curl downwards as the fruit develops. About a year ago, I wrote something about the mystery of the cyclamen flower. It has been my observation that the cyclamen flower is very fascinating. At that time, I thought that the reflexing of the petals was all there was to it. And yet as I continued to watch this plant I observe that the plant is in a serious business of ensuring a successful reproduction. Firstly, all the petals reflex up when the flowers open to expose the androecium (pollen-producing parts) and gynoecium (ovule-producing parts). This is nature's way of promoting effective pollination. Secondly, after pollination, the mystery continues as the plant tries to ensure that the seeds will eventually emerge into new plants. Fig,. 2 The fruits are tucked under the leaves to mature. Tucked Under the Leaves. When pollination has occurred and petals have dropped, the long flower stalk arches down (Fig. 1) to an almost perfect circle (the fruit almost touching the base of the plant)(Fig.2) as if to hide the fruits safely under the leaves. In the case of other species (Cyclamen coum, Cyclamen graecum, and Cyclamen rohltsianum), the stalks coil down. 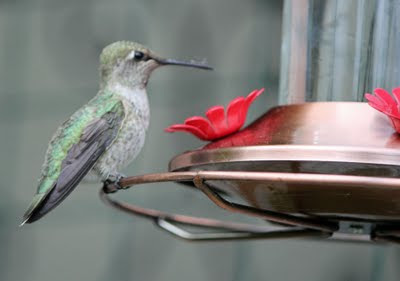 The seeds under the leaves are protected from seed-eating birds or larger pests. The foliage of the plant also provides a suitable microclimate for the seeds to grow. 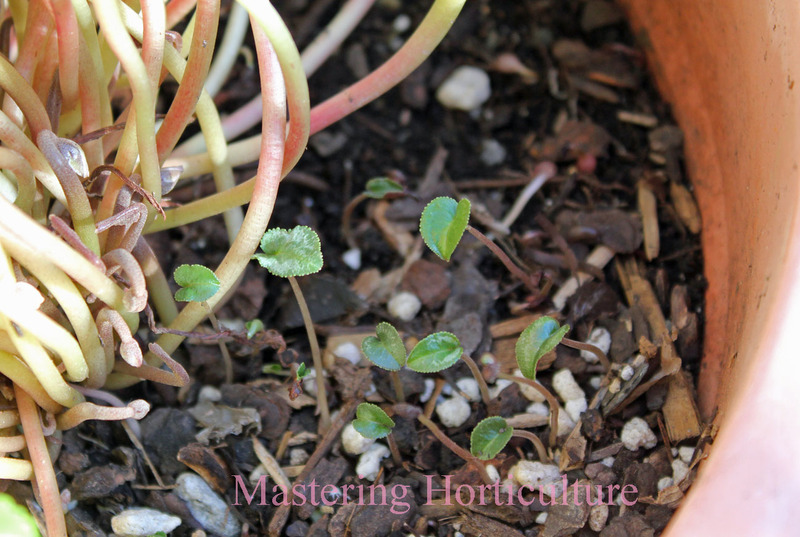 Studies have shown that, there are three primary requirements for successful cyclamen seed germination: 1) absence of light; 2) adequate temperature; 3) constant water supply. The thick and overlapping foliage of my plants inside pots provided all three requirements adequately as evidenced by the emergence seedlings (Fig. 3). Fig.3 Cyclamen seedlings growing at the base of the plant. New Life Begins. At the base of the plant, the fruits matured and seeds dropped as directed by nature. When I saw seedlings growing under the leaves (Fig, 3) I was reminded of chicks taking refuge under the wings of the mother hen. I am excited to have these seedlings and am curious to see what happens to them. It is my intention to transplant some of them and leave some to grow where they are. I wonder if these young seedlings are also equipped with yet another behavior that would allow them to make their way out from under the overlapping leaves of the mother plant. Winter Plant. At this time, my cyclamen plants are poised to bloom. New flower buds are emerging like snake heads from the base of the plants (Fig. 3). The patterned heart-shaped leaves (Fig.1) make the Cyclamen persicum an interesting plant even before the flowers come out. Cyclamen is not only an outstanding parent but also a striking winter and spring plant. Fig. 1 Droplets of water suspended on the tip of leaf blades. Water is a key component of any life form. In every organism, water is constantly moving within the system as the transport vehicle for essential elements. Water molecules move around in response to both environmental and internal conditions. In the case of plants when water is lacking, cells lose their turgor pressure and they behave in an austere mode - functioning to the minimum in order try to conserve all the remaining water within. On the contrary, when there is excess of water within and around the roots zone, plants behave in such a way that water is used up or released as fast as physiological processes allow. The plant system opens all water exits to the maximum because plant cells can only hold up to a certain amount of water before damage can occur. Fig. 2 Guttation: Water is pushed out through hydathodes. Excess Water. This topic is about a condition of excess water both in the soil and in the air. Water gets absorbed by the roots and released through the leaves. When the release-process is hindered by both sides of the system (by being saturated), the plant has to do something beyond ordinary. When you see your lawn in the morning glistening with drops of water suspended at the tip of every grass blade (Fig. 1 and Fig. 2), you are seeing a case of guttation. 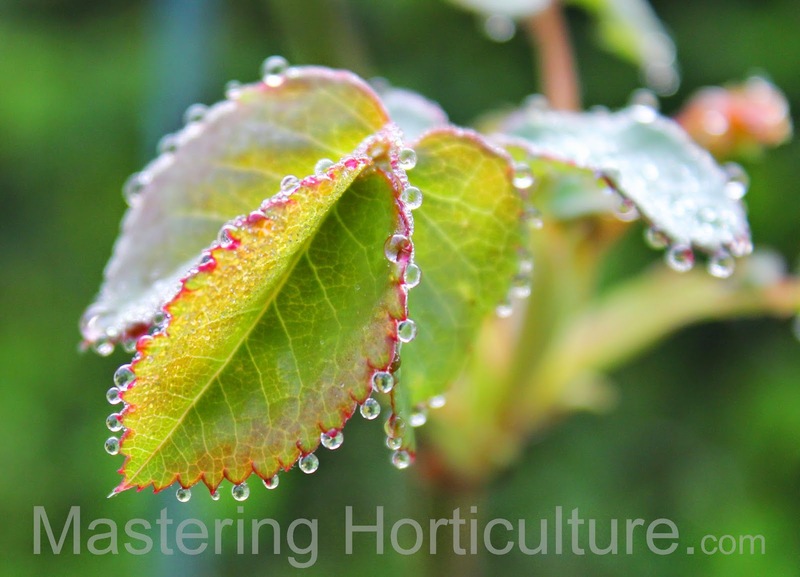 Guttation is simply the process when water from within the plant accumulates on the tips of the leaves. However, in order to fully understand guttation, we need to contrast and compare aspects of this phenomenon with similar but not related occurrences. 1. The water droplet: Is it the same as dew? During guttation, water droplets form at the apical margins of some grasses (Fig.1) or along the leaf margins of some dicots species (Fig. 3). These droplets of water are different from dew. 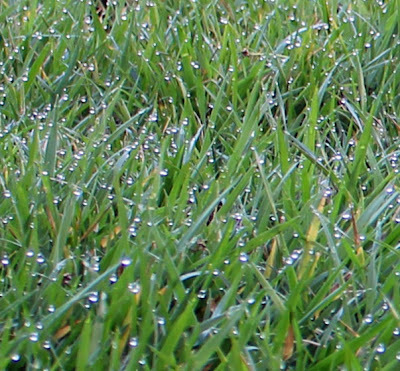 Dew is the result of condensation of atmospheric moisture. The whole surface of the leaves would be all wet. As the temperature cools down at night and evaporation of molecules outside the leaf slows down or completely stops, root pressure builds up causing water to be pushed violently upwards in search of an exit. Guttation droplet (fluid) originates from within the plant. Sometimes it is considered a xylem sap. It is not pure water since it contains some amounts of minerals and sugars. Guttation droplets form only around the leaf margin. Dew forms on the leaf surface. Fig. 3 Guttation on young leaves of a rose. 2. The Passage Way: Is it the Stomata? Some plant species are equipped with hydathodes. Hydathodes are pore-like structures along the leaf margins that allow the exit of water from the plant in liquid form (Fig.3). During photosynthesis, stomata open not only to allow carbon dioxide to get into the plant but it also allows the passage of water molecules. The stomata allow the exit of water in gas form. For that reason, although water is continuously exiting through the stomata, water is not visible on the leaf surface. The water molecules join the atmospheric air immediately. When the temperature is low (at night in particular), transpiration is dramatically decreased resulting in excess water in the plant system. However this does not mean that water stops getting into the plant. Through osmosis, water moves from an area of weaker concentration to stronger concentration. Because of the higher salt content of the plant sap, (difference in the salt content of the plant sap and soil moisture) water diffuses into the root xylem. As a result, root pressure builds up - water rushes into the plant but with low temperatures, a traffic jam occurs at the stomata exit. Fluids are then forced through the hydathodes and fluid comes out are tears along the leaf margins of some plants (Fig. 3). Guttation happens through a specialized structure called hydathodes. 3. The Process: Is it the same as transpiration? Transpiration is the process when the water molecules from the roots are lost into the surface of the leaves. Imagine that inside the plant there are tiny capillary tubes, called xylem, that stretch from the roots to the leaves. Then imagine that the tubes are filled with a single line of water molecules starting from right outside the root hair all the way up to the opening of the stomata by way of cohesion (the property of water molecules to attract the same molecules). As the outer-most molecule escapes the stomata into the air, the next molecule takes its position and the rest follow leaving a new vacant position at the tip of the root. So another molecule gets in. It's a cycle that goes on and on. There are two processes involved here: transpiration (exit of water molecule from the stomata) and water absorption (entrance of water molecule into the plant). Depending on the condition of the surrounding environment (temperature, relative humidity, wind velocity, light intensity) these stomata open and close to regulate transpiration. For the plant, transpiration is an on-going process. Guttation on the other hand is special-occasion process. Certain uncommon conditions have to be met for guttation to occur. Saturated soil and high soil temperature combined with high atmospheric humidity and low air temperature are the optimum conditions for guttation. This is usually happens at night that is why we see the beads of water only in the morning. Guttation happens only in specific plant species. The process is only possible in plants that are equipped with enlarged specialized stomata called hydathodes. I found an excellent picture of hydathodes in action - one can almost feel the movement of water through those openings. The image is very helpful in understanding the process of guttation. 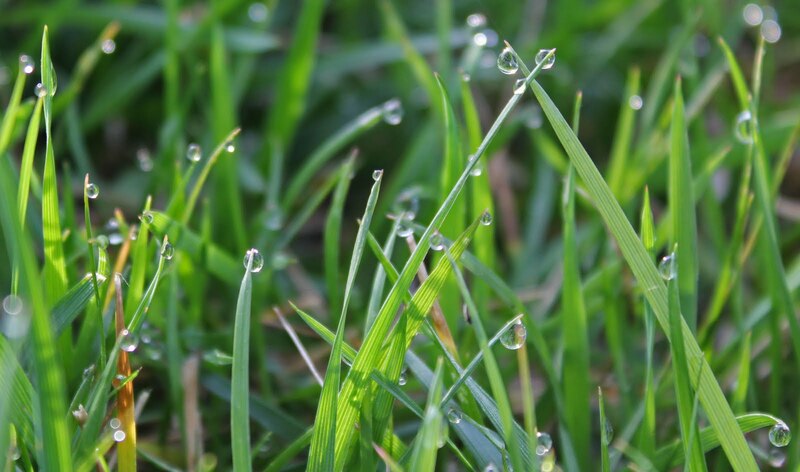 Guttation happens when there is excessive water in the soil and there is an absence of water loss through transpiration. Guttation is likely to occur during the night, hence the guttation droplets are seen in the mornings. Summer seems like a paradoxical blessing for the gardener. While it is the time when the sun-induced plants put on their best performances to wow the gardener, it is also the time when the gardener finds time to leave the garden in search of a refreshing break from the work in his own garden. It is the time when the gardener reaps the rewards of his labor. It is also the time when fruits and vegetables are so cheap at the stores - it makes one wonder if it was ever worth the effort to grow them. This summer, the number of days we spent at home was less than that which we spent away from home. Whenever we came back from our trips, I was always trying to squeeze in some time to garden but then there was a huge mountain of laundry to work on. Then there were fruits to harvest and eat that we could not keep up with. So then there were fruits to can. As a result there was even less time to garden and zero time to blog. But as the masters of the garden, we ought to choose the things we need to do. 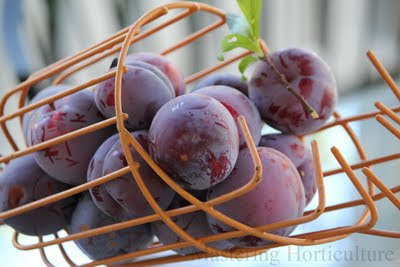 Plums. Compared to previous years, the plums (Fig.1) were late this year. However, with our busy summer schedule, timing was perfect - the fruits were ready during a two- week-period that we were home. So we harvested them and gave some to our friends. I canned plum sauce - a family favorite as pancake topping. Grapes. 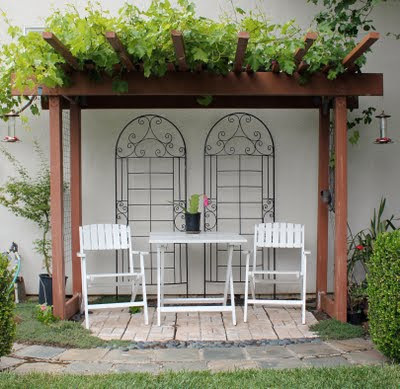 The main purpose of my grapevines is to provide shade. In other words, they are grown primarily for the foliage and not the fruits. 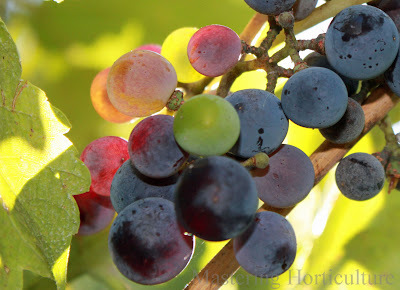 Nonetheless, we get enough fruits to make at least four quarts of jelly annually from the two Pinot noir. 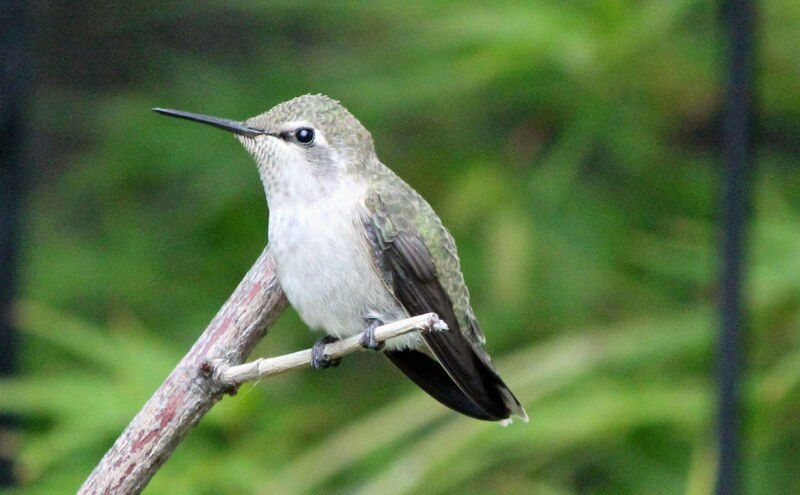 We get more if we do not wait for the larger birds (blue jays and robins) to get them first. I have one Zinfandel grapevine but it did not have fruits this year probably because it is now shaded by the ornamental pear that is planted next to it. In spite of that, it still gives a lot of shade. As summer approaches it end, the Swiss chards continue to grow without any sign of bolting (flowering). They have taken a great deal of heat during the summer and I admit that I left most of the watering to the sprinkler system. This would be totally alright but in our place there are days when the temperatures just get so hot - supplemental watering becomes necessary. As the plants put on larger canopies, the sprinklers need adjusting so that the water still gets to the right place. Swiss chards proved to be tough in this climate and in my garden. However, the leaves are decreasing in size and showing slight sign of chlorosis or yellowing (Fig.3). I will try to prolong their production time by adding a little bit of nitrogen fertilizer. I am curious to see which factor will stop them from growing - whether temperature, or flowering. Radishes. Unfortunately, we got to eat only a few radishes. They were overgrown by the time that we had time to consume them. I left some plants to flower just to encourage the pollinators to stick around and to allow the plants to produce their seeds for the next crop. Pears. We have a good crop of pears this year. Coddling moth infestation still managed to leave signs of their presence in some fruits but the infestation is dramatically reduced compared to that of last year. This could be attributed to the insect trap I used in the early spring. I believe that it would have been more effective if I had installed more than one trap per tree. Recently, I learned that it is a good idea to have moth traps from April to September and replacing them as necessary. I'll try that next year. Most of the branches are bent severely downward (Fig. 5) because of the heavy fruits. Fortunately, the branches are pliable. Another to-do-item is pruning the tree this fall. So far, jars of pear butter line one of the counter tops in the kitchen - and yet we still have so many fruits hanging on the tree up to this time. Tomatoes. My tomatoes are late this year. They are at the peak of their production now and yet autumn is here. The heirloom tomatoes (Fig. 6) are very sensitive to heat. The plants basically stopped setting fruits during the hot months and are just starting to fruit again. 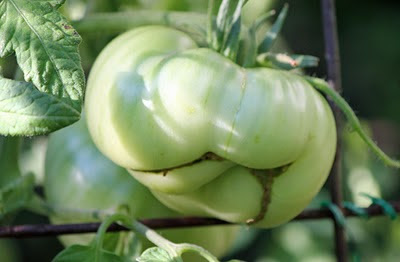 At this rate, there will be green tomatoes in the Thanksgiving menu. Apples. The Fuji apples are almost ready. The crabapple fruits are abscising (falling off) from the tree but I do not know what to do with them. They are so tiny to make into anything of consequence - or am I wrong? Pomegranate. The pomegranate tree did not produce any fruits yet. It's been a year since I brought it into my garden. It flowered in early spring but the fruits did not set. 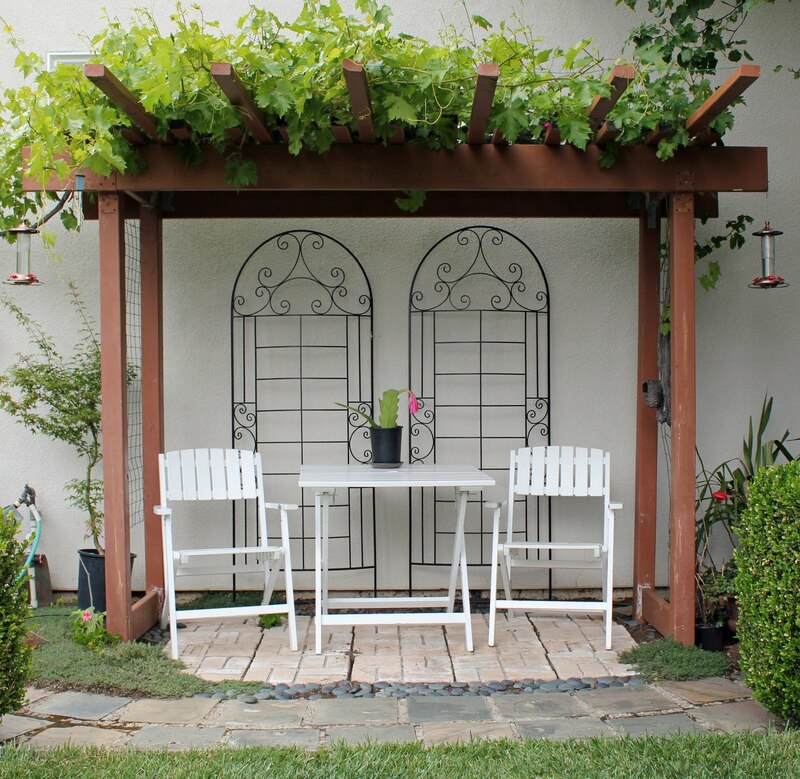 Grow your food in the neighborhood of your kitchen. 1. Water moderately. Watering once or twice a week is sufficient. Too much water can cause the tissues to burst and die resulting in the appearance of corky brown spots of the semi-succulent leaves. This case is called edema. The plant takes up more water than it can release through transpiration. Unlike some plants such as grasses that can push the water out through specialized openings on the leaves (called hydathodes), ivy geranium succumb to breakage of its 'bloated' tissues. 2. Fertilize moderately. It has been my observation that small amounts of soluble complete fertilizer can be added every two weeks during watering. Under this climatic region, ivy geranium remains green throughout the year but I stop fertilizing in late fall to force my plants to go into pseudo-dormancy in preparation for a bigger show in early spring. 3. Balance sunlight against temperature. 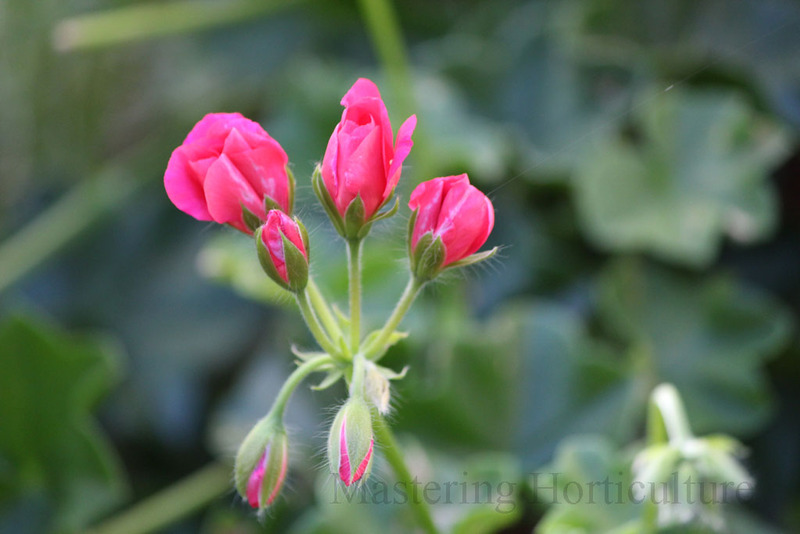 Ivy geraniums are sun-loving plants and yet they also enjoy moderate temperatures. The optimum number of hours of sunlight depends on the prevailing climatic condition. I have noticed that ivy geranium bloom happily in hanging baskets along the streets of London, Toronto, San Francisco, and Seattle where they get sunlight all day. Climate in these cities are generally mild as influenced by the coastal breeze. On the contrary, in places (like mine) where summers are very hot and dry, some afternoon shade benefits the ivy geraniums a tremendously. 4. Prune regularly. Maintain the size and shape of ivy geraniums by pruning regularly. Freshen up the plants by removing old and woody stems. This will encourage the growth of more branches and thus more flowers. Spent flowers fall off naturally after a while. However, if you are someone with Type A personality - by all means, dead-head. Kalanchoe panamensis is a very interesting plant. Depending on the surrounding moisture conditions, roots freely come out from the upper parts of their stems (Fig. 1). Once these roots reach the ground they function as a regular root (for absorption) and as stilt roots (for plant support). As the stem lodges, the plant anchors to the ground with these roots allowing each node to be anchored and independent. This prepares each section of the plant for any eventual separation from the main stem. This is what I call 'life insurance plan'. From the leaves, new shoots grow to become new plants (Fig. 2). This is a common occurrence on the leaves that have fallen off the plant. Even without gardener's intervention, the residual soil moisture underneath the leaves is sufficient to get the new sprouts get established. With these characteristics, this plant has one mission - to clone itself for self-preservation. Fig. 2 Adventitious shoots growing on a detached leaf (Kalanchoe panamensis). Adventitious Roots. The standard root system of a plant originates from the radicle in the seed. The radicle grows to become the primary root. From the primary roots grow lateral roots. As a general sequence, lateral roots always grow from roots. Roots beget roots. However, there is a specialized type of roots called adventitious roots that originates from unusual and unexpected parts on the plant. Adventitious roots form on stem or leaf-derived tissues. Adventitious Shoots. The first shoot from a seed originates from the plumule which eventually grows into the primary stem. Then lateral buds grow from this main stem. However there is a shoot formation that takes place on root and leaf tissues (Fig. 2). This is called adventitious shoot formation because the shoot or buds grow where they are not expected to. Adventitious root and shoot formation is the key phenomenon that leads to regeneration. It is the same phenomenon makes tissue culture possible. When a plant is stressed or injured or detached from the plant, the natural response of the plant cells is to start life all over again. Where would cloning or asexual propagation be without these roots and buds that grow from unexpected origins? It is unimaginable how we could have two plants that are genetically the same if plants were not capable of growing adventitious roots. 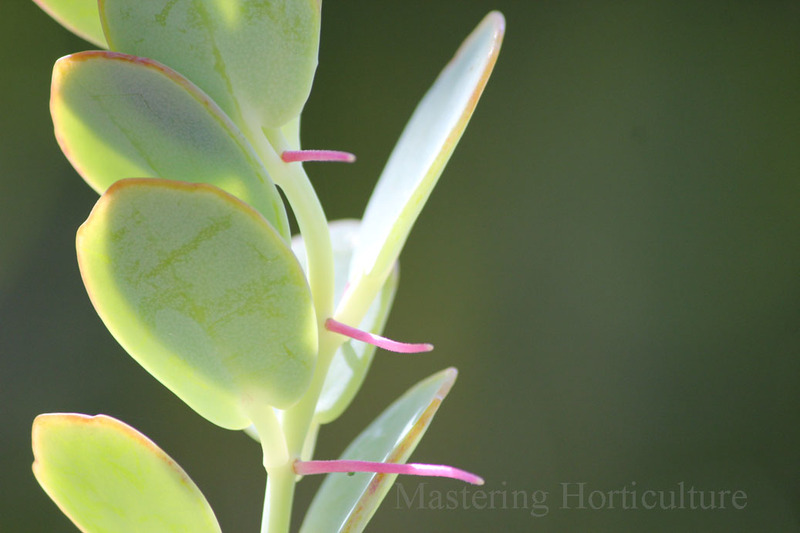 Many succulent plants clone themselves naturally like Kalanchoe panamensis. 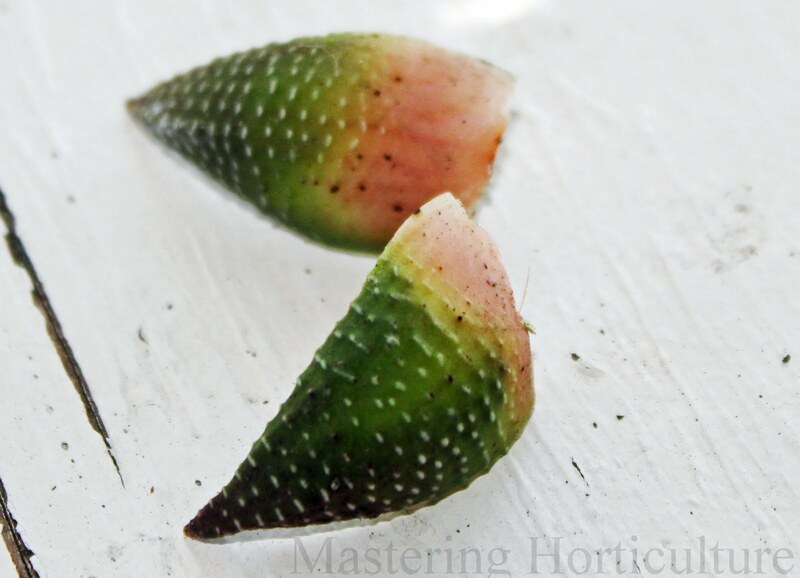 Some grow roots at the base of the leaves instead of the edges of the leaf blade such as Echeveria 'Black Prince' in Fig.3. You can probably name a few species that does exactly the same thing. The fact is that succulents thrive on less water. Some of them originated from places where environmental conditions may not permit the completion of their life cycle - meaning from seed to seed. However, they have been equipped (by the Creator) with the ability to reproduce themselves apart from the seeds. This ability is backed by adventitious root and adventitious shoot formation. As a result, we can get plants that are genetically identical over and over again. We can design gardens and plan on the exact full size, color, and flowering time of every plant we put in the ground - all because of adventitious roots and adventitious shoots. Fig. 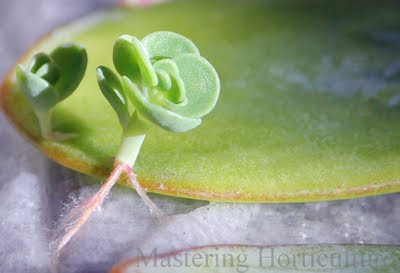 3 Adventitious roots on leaves of Echeveria 'Black Prince'. Kalanchoe panamensis is just a visual aid to demonstrate what we often take for granted - the adventitious root and shoot formation. Can you name some plant species in your garden that clone themselves naturally? A year ago during our trip to Southern California, we visited some friends in Oxnard. They gave me this interesting plant (Haworthia reinwardtii) (Fig. 1) already with five offsets. I thought that I'd wait for it to grow some more before repotting. Flowers (Fig. 2) came out on long spindly spikes twice during that time. A few leaves grew on top of the neatly stacked arrangement - adding more height to the offsets. For plants like this, production means the appearance of new plants in the form of offsets. However, no new offsets appeared. The plant was moved to different places in the yard to compare how it would perform under different conditions. The plant grew minimally regardless of the location. Observations. The color of the leaves (Fig. 3) changed with light intensity and soil moisture levels. When exposed to more sunlight the leaves turned reddish and when the plant was in the shade the leaves turned back to green. The leaves also developed a yellowish tint when water was withheld for an extended period of time. The lack of moisture generally slows down photosynthesis which consequently results in reduced chlorophyll production. The leaves (Fig. 3) of this plant are very hard and crusty - they remind me of armadillos. Shocking Observations. I've waited too long - I could not wait for a substantial growth to happen on this plant anymore. So I decided to do a deeper investigation into this potted plant. It was surprising to find out that the plant was growing in pure sand (Fig. 4). If there was any other material in the pot it was only a few dead roots. The poor plant was living in an almost inert material. It appears to me that whoever planted this plant was more concerned about drainage than nutrition. One thing became very obvious - the plant can withstand extremely poor soil conditions. However, for optimum growth, the essential elements have to be provided to the plant. This is probably the reason why the plant failed to multiply. Solution to Problem. The plants were repotted into five individual plants. New potting soil with considerable amount of organic matter was used. They are currently being held under the shade of a tree while recovering from the transplant shock. Expected Outcome. In the new potting soil, it is expected that the plants will respond to the nutrients present in the soil. New offsets might begin to appear at the base of each plant. Dividing the plant allows more room to for each plant to grow. When plants are not growing normally it it likely that it is deprived of something - soil nutrients, water, sunlight, or air. Mrs. Quail sits under the canopy of a lettuce plant. Quails don't walk slowly when they know I am in the garden. They fly away. When I saw Mrs. Quail walk quietly away from the vegetable garden, I knew she was hiding something in there. Like discovering some treasure, I found ten speckled eggs nestled under the ruffled lettuce leaves. We have been gone away for a long time this summer. Mr. and Mrs. Quail decided that the garden was a promising place to raise a family. Here they found food, water, and shelter. A few years ago, we had another quail nest in a pot of ivy geranium. My children looked at the mother quail sit there every day. Then one day, all they saw were egg shells. My kids were very sad. However, a few days later, we saw a family of quail with twelve chicks cross the lawn in a single file. They were so cute! This time my younger daughter visits Mrs. Quail every morning. She hopes to be able to see the chicks when they hatch and before they leave their nest. Planting of the next vegetable crop will be delayed until the eggs are hatched. Clusters of tight pointy buds emerging in creamy-apricot color. I am currently traveling in Colombia with my family. Colombia is such a botanical paradise and as soon as I get home and finish putting away the suitcases, I will share some of my experiences in this blog. In the meantime, I reflect on the beautiful 'Sally Holmes' rose in my own backyard. This is a shade tolerant rose. It is vigorous, drought tolerant, and resistant to pest and diseases. A perfect bouquet on a single stem. 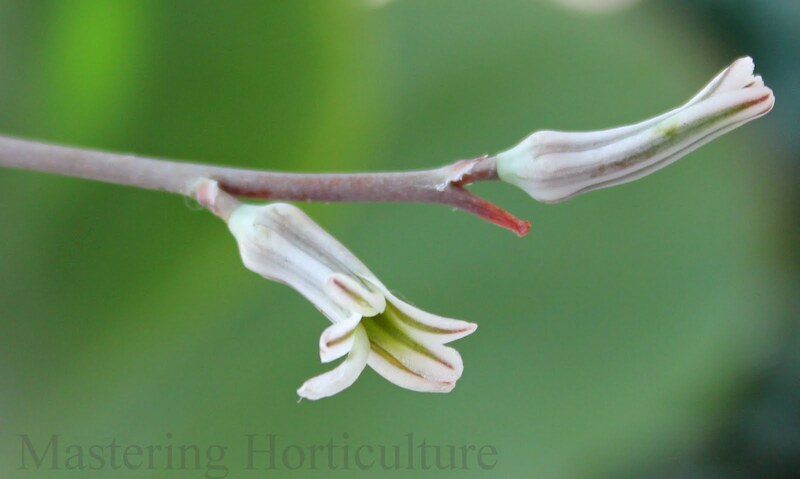 Buds open one after the other - creating an assortment of creamy flowers on one stem. The colors of individual flowers range from creamy-apricot pink to creamy white. Flowers in the shade seem to retain their pinkish blush longer than those that are in the sun. Rambling on top of patio cover. 'Sally Holmes' makes a great country garden rose. It sends out tall healthy canes that require a lot of room to ramble. In my garden, 'Sally Holmes' rambles on top of a 10-ft tall patio cover. Other than occasional pruning to keep the pathways clear, the rose requires very little maintenance. 'Sally Holmes' rose has flowers that form a perfect bouquet on a single stem. Every year is different. We have had a lot of rain this year. Normally in the month of June my garden is somewhat starting to wear out the chlorophyll effect. In other word, our place starts to get really hot in May. So far, I have not seen a sign of global warming in my garden this year - or else it came camouflaged in low temperatures and high precipitation. Since this has been an unusual year, I thought that I'd take pictures of the front yard before the blazing light intensity and soil-cracking low relative humidity turn the greenery into gray or golden brown. So I stood in the middle of the driveway and took pictures of plants that surrounded me. Trees in need of pruning. Northwest - my neighbors carpet roses. Roses in front of the house. One of the joys or curses of having a relatively mature garden is that plants tend to grow voluntarily at random places. I have a story of a joyful phenomenon in my garden. When I transferred 'Madame Isaac Pereire' to a more sunny location in the garden, some roots were unintentionally left in the ground. The following year I found a two new roses growing from the same place. They had the same flowers and intense fragrance as the plant that was taken out. This means that I had cloned my 'Madame Isaac Periere' rose without even trying! The original plant was growing from its own roots (not grafted) and that the new roses grew from the roots that remained in the ground. Today, I have three plants of this variety growing in three different spots of my garden. I had spread them so that I can have more places where I can enjoy them. Plant roots spread far and wide in search of water. As a result when we try to contain or move them, there is a greater chance of leaving something behind. If the plant that grows is prized for one reason or another, this is a pleasant occurrence. On the other hand this can also be considered a curse if we do not value the new "volunteer". Have you ever had some "valuable volunteers" in your garden? A place to watch the birds. 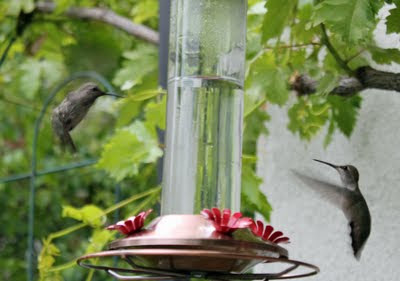 With the addition of two hummingbird feeders on both ends of the arbor, we have attracted more hummingbirds to reside in the garden. The arbor provides a shady place for us to observe them. 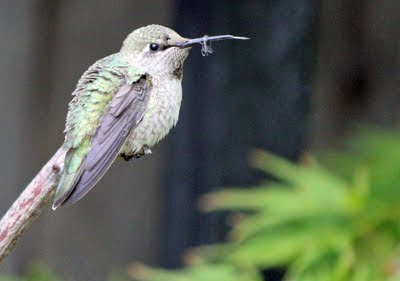 Perched on a tiny branch in between feedings. Feeling content with a bountiful supply of food. 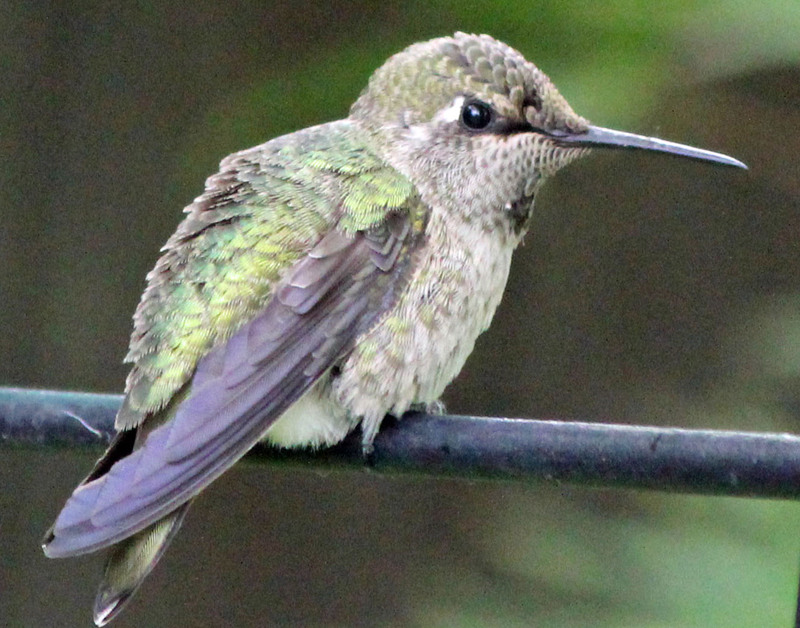 Sign of victory: Feathers on the beak after a fight. Insecure - still watching over the feeder. Why can't they share? A year ago I received a box of flat broad succulent plant parts from one of my relatives living near Santa Barbara, California. I did what I thought was right but I had little hope on their survival under the care of my amateur hands. It was my first time to raise this type of plants. Flowers resemble the shape of a pinwheel. Epiphyllums are known by many names: Epiphyllum phyllantus;Phyllocactus phyllantus; cactus orchids; Epi; Epiphyllum Hort; etc. The accurate name is a highly debated topic among enthusiasts and scientists around the world. 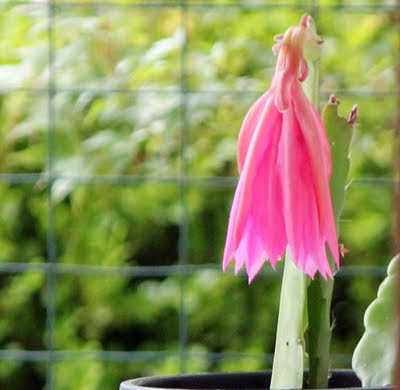 However, until an internationally accepted name is published, I will use the name epiphyllum (lower-case e and un-italicized), which is the one adapted by the San Diego Epiphyllum Society. A close-up on the flowers: White colored pistil and cream-colored stamens against the pink petals. Some of my epiphyllums are now blooming and they look stunning. The flowers were supposed to last only a day or so and longer in cooler temperatures. Since our weather has been staying below sixty degrees F, I noticed that the pink flowers have remained more than a week while those with orange flowers remained for two weeks. Fading of the flowers is signaled by the closing of flowers. Even when the flowers are closed their sharp colors remained. I'm still waiting to see whether or not fruits will develop. My next plan is to experiment on bringing some of them inside as houseplants. In as much as they are shade-loving plants, the limited light indoors might be sufficient for them. Furthermore, the stems do not change that much and there are no leaves that would wilt when I forget to water them. Most of the epiphyllums we know today are hybrids from species that originated from the jungles of the Americas.